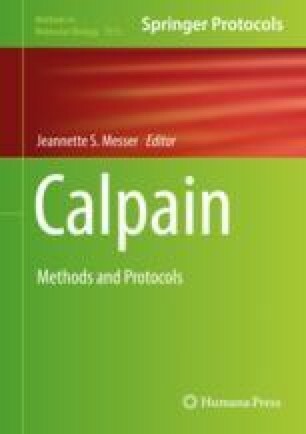 Casein zymography is used to detect calpain activity in cell or tissue lysates. In this technique, lysates are loaded into a polyacrylamide gel containing casein, and the enzymes within the lysates are electrophoretically separated. The casein embedded in the gel acts as a substrate for calpains in the lysates, and its degradation reflects the activity of these enzymes. Calpain degradation of the casein is visualized as distinct bands that are devoid of dye when stained with Coomassie Brilliant Blue G-250. We describe here how calpains can be extracted from muscle tissue and assayed for activity using this technique. This technique is also generally applicable to lysates from other types of cells or tissues. This work is supported by DST (Govt. of India) grant SB/FT/LS-283/2012 and the Indian Council of Agricultural Research, New Delhi (Ministry of Agriculture).